Blog posted by: GDS Academy Team, 12 December 2018 – Categories: People and skills, Technology. Technology is evolving faster than ever and as a Civil Service, we are keeping pace with this change. Our commitment to make government work better for everyone by harnessing digital and new technologies to build effective services is supported by our aspiration to have one of the most digitally skilled populations of public servants in the world. But digital skills alone are insufficient. Digital understanding is paramount to the success of government transformation. We believe that an understanding of technology - both present and emerging - should be core to the practice of the Civil Service. So following a successful pilot in early 2018, the GDS Academy has launched the Emerging Technology Development Programme. It's now open for applications from across the Civil Service until 5pm on 11 January 2019. The programme will create a deployable team of specialists with the skills, knowledge and confidence to advise on the application of emerging technologies to solve government’s most difficult problems. It will partner small groups of qualified civil servants with world leading specialists through a tailored 10-week curriculum of learning. The first call for applications focuses on Artificial Intelligence (AI) and machine learning. It’s planned that future topics will include distributed ledger technology, augmented and virtual reality, biotechnology, geospatial technology and quantum computing. 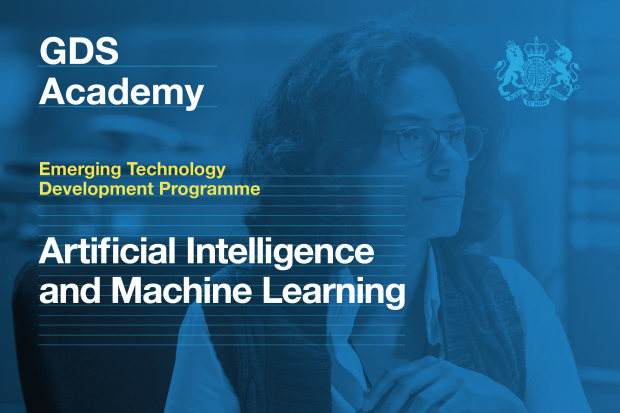 “Thanks to its versatility, AI and machine learning can be used everywhere to accomplish services and enhance the quality of their provision across sectors like health, energy, environment, transport, housing, manufacturing,” says Prof Hamid Bouchachia, Professor in Data Science and Intelligent Systems at Bournemouth University, as well as one of the academic tutors on the programme. The programme is designed to significantly enhance government capability. It will help departments make the best use of emerging technology and build internal capability within GDS and wider government to stay ahead of the transformation curve. “AI can help government improve its services to its citizens in a number of ways. The new programme reflects the wider expansion of the GDS Academy’s curriculum to cover the breadth of new technologies impacting public services. Find out more information including how to apply for the Emerging Technology Development Programme. If you’d like more information on all our courses and programmes visit the GDS Academy. You can also follow @GDSacademy for updates.